To be honest I'm pretty much a sour puss when it comes to Valentine's Day which is so odd for me because I'm a total hopeless romantic. Just something about the holiday has always bothered me and I can never put my finger quite on what it is. This year's Valentine's Day turned out surprisingly swell though! I wore my red rose floral crown today which put me in the perfect Valentine's Day spirit. My classmates totally had me blushing today by saying I looked like a Valentine's Day goddess! My teachers gave me all sorts of little sweets all day such as mini cupcakes, conversation hearts (in Spanish! ), and heavily frosted cookies. Yum! I came home from school and took outfit pictures while it was snowing and totally beautiful out... It's odd that when I'm inspired I'm not even bothered by the cold! Matt came over to my house and totally surprised me though with a dozen roses and a box of chocolates...We aren't really 'gift givers' when it comes to each other, so it was such a sweet and unexpected gesture of him. It's funny though because I actually ended up getting him something, too. Although we didn't end up 'officially' end up buying gifts for each other this year, we did so anyways! These pics are postcard perfect, Lauren. Happy Valentine's Day! YOU LOOK MAGICAL! adore this outfit and Happy Valentine's Day! You do look like a Valentine's goddess! So gorgeous. I think I especially love the rose crown. the floral crown is magnificent! i love how everything is white like the snow around you. beautiful. happy valentine's day! I love your outfit and I have that dress in black! Happy Valentine's Day Lauren! You look stunning, as always, I love that floral crown too! Amazing job on that, you should do a DIY tutorial for it! Glad your day was full of goodies and sweet surprises! You look gorgeous. Love all the red and white. You are totally the Valentine's Day goddess, I'm glad you had a good day. You really look absolutely divine, Lauren! These photos are so hazy and dreamy, too...I love them. Oh Lauren, You are amazingly gorgeous. I love hearing about you and Matt, how you all just keep the romance in full bloom all year long. You inspire me...Happy Valentine's Day to you too. ah, someone else noted it, but it really reminds me of santa lucia. when i was a kid, my parents got me a santa lucia outfit (my dad works for a swedish company) . Thank you so much for the kind words! 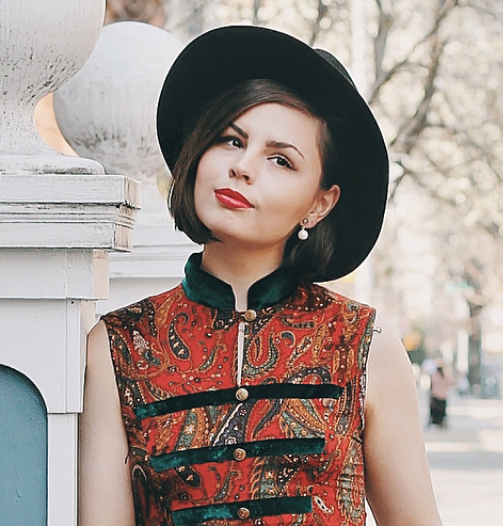 Will definitely be following along your blog too- such lovely outfits! Enchating, dreamy, story like photos. I love. I think this is my favorite yet! You do definitely look like a goddess. Your crown is inspiring! I'm glad you had a great Valentine's Day and hope you've had just as good as a week. Oh my, I have been so negligent in posting comments! Dear Lauren, I am so sorry! You looked absolutely beautiful on Valentines day! I really adore your rose crown and that dress on you is stunning! The snow in these photos just adds the perfect touch. I sometimes wonder if I am in Narnia when I look at your blog photos beside the tree- especially the dreamy ones! So beautiful Lauren- I adore your Valentines day look. I took a dress to Paris with me to wear on Valentines day (black with red roses) but because it was so cold and we went straight out from wandering round the city, I didn't end up wearing it. Thus I am living vicariously through you with this romantic rose outfit! You looked so pretty for Valentine's day! The floral crown was perfect! You definitely look like a Valentine goddess. sounds like Rob and I. we aren't gift givers. We'll get each other some things randomly but yeah. . I didn't even get a card on Valentine's Day, and that's fine. He shows me love in other ways. He doesn't really know how to be romantic though. haha. Anyway now I just adore these photos and this outfit. You look so lovely in it with the cute headpiece crown!